Yeah, I'm now one of those people who emphasize with periods. The speediness of this knit requires it. This is Agnes by Melissa Labarre. 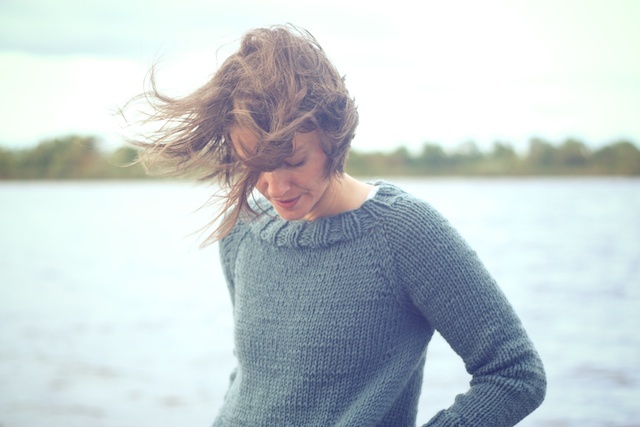 If you're ever on Ravelry you have probably seen it. I did a couple of years ago and have been hoarding some bulky wool for a year in the hopes of making it. Since my first sweater was finished for the Summer Sweater Knitalong, I thought I'd try to make a second one. Now it looks as though I may start a third because this knit up so fast. It took eight days, and that includes some ripping back and adding length. I like the fit too- very weekendy. Thanks to my husband, I got some weekend photos by the river. We only got a couple of looky-loos, driving past us slowly and smiling at me with that "I like the Tin Man." expression. My mods were nothing serious. I knit the size 34" but increased 10 more times for the raglan shaping, instead of 9. This gave me extra stitches, so for the pocket opening I knit to side marker, sl marker, knit 4, then placed 49 sts on waste yarn. As I mentioned I did add about 4 extra rows (an inch) of length before starting the pockets. It is still cropped enough for me. I love contrasting pockets. I used a lighter weight yarn (Paton's Classic Tweed) for them and the same size needle as for the sweater so they wouldn't be too bulky. I like how the brown tweed looks against the Cadet colorway. 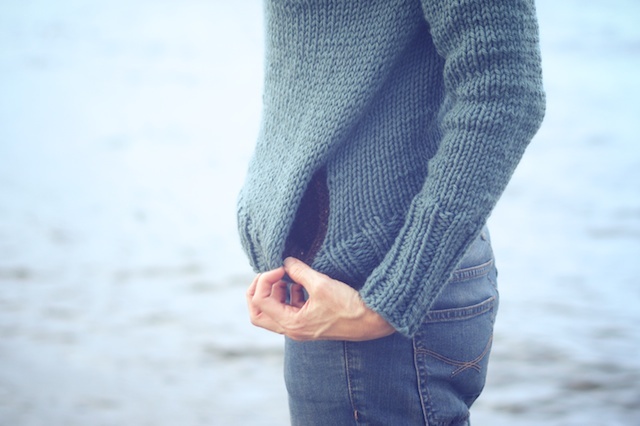 What I love about this sweater is the boxy shape, how it's slightly cropped, those pockets, and Wool of the Andes Bulky. 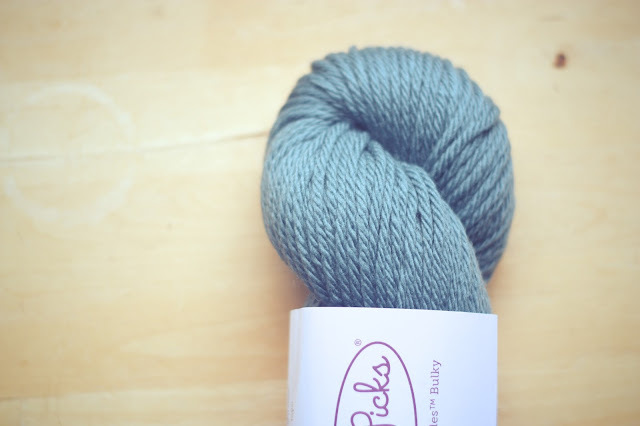 This wool is super affordable and comes in plenty of colors. I just haven't used it a ton because it is very warm. 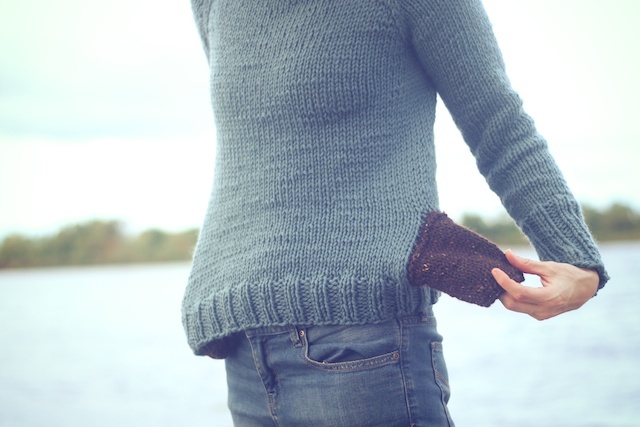 I'm already planning how I'll frog an old sweater knit in Lion Brand Landscapes and reknit it as an Agnes in reverse stockinette body... maybe. Oooo, it look so cozy! 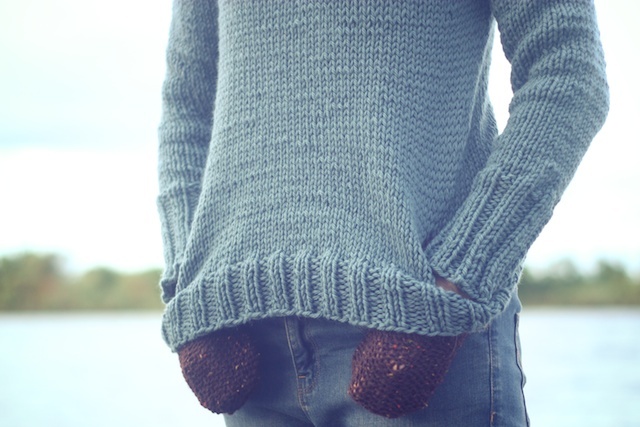 I love sweaters like this - lovely work! I love it! I'm going to have to add it to my list now too :) I love the new hair cut too. You look fabulous. Have you had your hair cut? I love it. Actually, I was just dreaming of cutting mine off too - must be something in the air. It looks so warm and cozy, ideal for those winter evenings. I love the detail of the pockets in a different color. Thanks, Katie! It's a winter no- brainer sweater. Thank you, Jennifer. This is almost instant knitting gratification and so cheap in wool of the Andes, I couldn't not knit it. Looking forward to seeing yours. I love the pockets too, especially that they're tweed. It's weird the things we find special about what we make- like fabric linings no one sees or the non scratchy zipper you put in your dress. Those little details make the knit.